Check out the recently published “The Haywire Heart” by Chris Case, John Mandrola, MD, and Lennard Zinn. The book is available at Amazon and other outlets. You may recall that Case, Mandrola, and Zinn authored an article in VeloNews, entitled “Cycling to Extremes: Are endurance athletes hurting their hearts by repeatedly pushing beyond what is normal?” This was a terrific read. I wrote a previous blog post sharing my thoughts about the article and about the issue of arrhythmias and endurance sport, more generally. Their article generated much discussion in the cycling and broader endurance sports communities and the interest of readers served as the motivation for their new book. This is a book about electrical problems in the heart–the various arrhythmias. Case, Mandrola, and Zinn are in a unique position to bring this topic to life because each has dealt personally with some form of arrhythmia. And as long time cyclists (and perhaps with some triathlon experience as well), they’re able fashion the discussion to the avid endurance athlete. From the medical perspective, the field of arrhythmias is rather complicated, both in terms of the underlying mechanisms of disease and the evaluation and treatment of affected patients, but here the authors have found a writing style that is captivating and accessible to the non-medical reader, while retaining much medical detail that will be of interest. I give them credit because this is hard to do! I love the title. 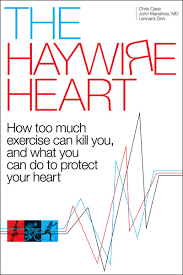 With an arrhythmia, the heart is truly “haywire.” Ignore the line on the cover, though, about “How too much exercise can kill you.” That’s unlikely to happen and there’s little in the book about that particular issue. Instead, focus on “what you can do to protect your heart.” That’s where the value lies here. The book is organized into 9 chapters. In Chapters 1-3, the authors describe in detail how the normal heart works, outline how the heart adapts over time to endurance exercise, and introduce the medical aspects of heart attack and arrhythmias, especially for the endurance athlete. These sections are well-illustrated and are a great primer for any athlete interested in learning more about the heart. Chapters 4-6 focus on the evidence of a link between long-time endurance exercise and arrhythmias, what to look for in yourself, and what it’s like to receive the diagnosis of an arrhythmia. Here, the authors speak from personal experience and their observations and advice are valuable. Chapter 7 deals with the issue of exercise addiction. We know that exercise is generally healthy, but most of the benefits of exercise accrue with the first few hours per week. Why, then, do athletes exercise more? When does one become addicted? What are the implications? This is an interesting and pertinent discussion and might provoke some warranted introspection. Chapter 8 covers the various treatment options for athletes with various arrhythmia problems. For athletes who don’t have trouble with arrhythmias, the discussion is educational in a broad sense. For those who do have arrhthymias, though, there is ample detail here to become educated and be better engaged with your doctor(s) as you sort out the best treatment for you. Finally, in Chapter 9, the authors wrap up with their “takeaway” on how we might prevent arrhythmia problems. One of my favorite aspects of the book is the inclusion of Case Studies sprinkled throughout the text, where the authors illustrate their points in a side bar with the personal account of an athlete. These stories bring us the human side of arrhythmias and show how difficult these problems can sometimes be. the athlete with an arrhythmia problem. There’s a lot of familiar territory here as well as the opportunity to learn more. An educated patient is the ideal patient. the athlete with simply an interest in the heart. I can’t think of a better resource to become educated about the workings of the heart, particularly as they relate to the endurance athlete. the athlete (or the athlete’s spouse or parent) who’s afraid of causing harm to the heart through exercise. Be forewarned and be vigilant. In the Medical News: Does Heart Function Suffer in Long-term Endurance Athletes? Moderate amounts of exercise produce a multitude of health benefits. Both the American Heart Association (AHA) and World Health Association (WHO) now recommend 150 min per week of moderate intensity exercise for adults. Some recent observations, though, have raised the question: when it comes to exercise, can there be too much of a good thing? And, more specifically, can too much exercise somehow be harmful to the heart. With the increased popularity of adult recreational and competitive sports–particularly in cycling, running, and triathlon–there is a growing number of adults who are pursuing exercise far in excess of the AHA and WHO recommendations. The questions surrounding the issue of “too much exercise” are very pertinent. The worrisome observations have generally been made in small numbers of symptomatic athletes, in groups of athletes whose athletic history–or “dose” of exercise is poorly characterized, or in studies that were designed for some purpose other than determining the effects of “too much exercise” on the heart. I’ve said previously that these observations deserve our attention, but that we really need more targeted investigation into this issue. In a study just released online (ahead of print) in the medical journal, Circulation, Philipp Bohm and colleagues from the Institute of Sports and Preventive Medicine at Saarland University in Germany bring us an important new look at “extreme” exercisers. A former winner of the Munich Marathon. A control group consisted of 33 healthy Caucasian men who were pair-matched for age, height, and weight. 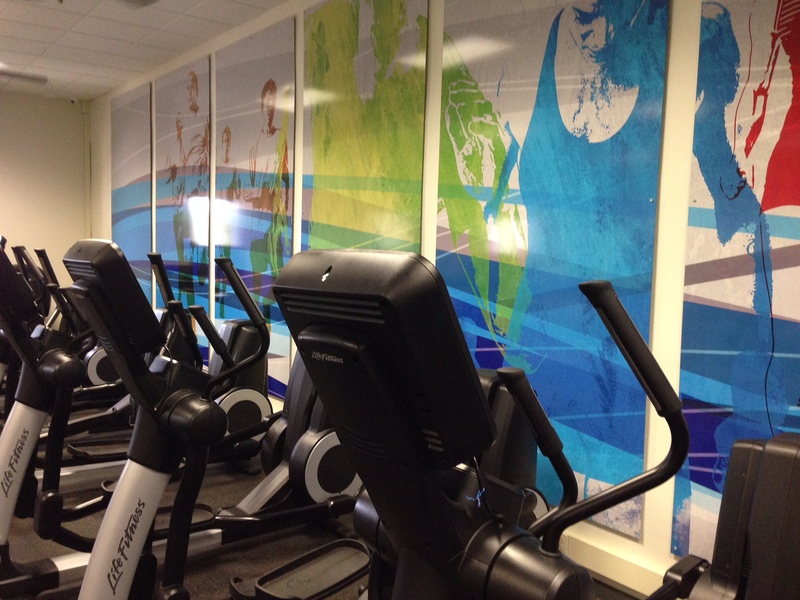 This control group was selected to include only individuals who exercised <3 hours per week. Contrast-enhanced cardiovascular magnetic resonance imaging (CMR). Interestingly, none of the athletes presented with, or reported a history of, atrial fibrillation. There were several unsurprising, and expected differences between the athletes and the controls. First, the resting heart rate (HR) for the athletes (48 +/- 7 beats per minute) was slower than for the controls (65 +/- 11 beats per minute). Second, the size of the athletes’ hearts was significantly greater. The left ventricular (LV) mass for the athletes’ hearts (188 +/- 26 g) was significantly greater than the controls (124 +/- 23 g). Similarly, the right ventricular (RV) mass for the athletes’ hearts (70 +/- 13 g) was significantly greater than the controls (49 +/- 11 g). Among the 33 athletes, 22 met a traditional definition of “athlete’s heart,” with a heart volume of 13+ mL/kg of body weight. As expected, the VO2 max of the athletes (60 +/-5 ml/kg/min) was significantly greater than controls (37 +/- 6 ml/kg/min). The important results of the study were those that showed no difference between the athletes and the controls. With echocardiography, there was no difference between athletes and controls in LV longitudinal strain or RV longitudinal strain–measures of the strength of contraction. Using CMR, there was no difference between athletes and controls in LV ejection fraction (EF) or RV EF–again, measures of the strength of contraction. One athlete (3%) had a LV EF slightly less than normal, at 45%. No athletes or control subjects had abnormalities of the RV that could be suggestive of the potentially life-threatening problem of arrhythmogenic right ventricular cardiomyopathy (ARVC). One athlete (3%) had late gadolinium enhancement (LGE) on CMR that suggested previous, asymptomatic inflammation of the pericardium, the sac in which the heart sits. LGE analysis showed no evidence of unusual fibrosis or scarring in either athletes or controls. Kudos to the investigators here. The study is apparently self-funded. It’s expensive to perform this kind of testing; in the United States, the costs of this study would easily run into the many hundreds of thousands of dollars. Kudos, too, to the editors at Circulation. There is a tremendous bias against publishing so-called “negative” studies, where no important differences are found between study and control groups. Many “negative” studies are left on the editing room floor–and we never hear about them. This is an important study because it is the first to gather and study a group of long-term endurance athletes with a substantial, and defined, training load over an extended period of time. The results deserve our attention. At nearly 17 hours per week of exercise or training, these athletes obviously far exceeded the contemporary recommendations for 150 minutes of moderate exercise per week. Just doing some quick math, the average cumulative exercise “dose” is more than 25,000 hours. As I’ve said many times before, it’s worth asking the question if such an exercise pattern can be harmful to the heart over the long term. This is a terrific group of athletes to study in order to help answer that question. We must keep in mind that, with just 33 athletes, this is a small study. With only 33 athletes, it’s obviously possible to miss something that would be found in the 34th athlete. We must also keep in mind that the study only involves male athletes. Female athletes are not immune from heart problems and deserve study, too. It is a striking finding that no athlete was found to have atrial fibrillation–either now, or in the past. Moreover, no athletes experienced arrhythmias during the cardiopulmonary exercise test. A number of previous studies have reported a 2- to 5-fold increase in atrial arrhythmias among long-term endurance athletes. Like the current study, all of those previous studies have involved small number of athletes. None, though, have focused on athletes like these, with such extensive exercise and training histories. In my opinion, endurance athletes broadly can take some comfort from the findings of this new study with regard to the potential risk of atrial arrhythmias. It’s noteworthy that the LV and RV function of the athletes was no different than the controls. One athlete had mildly depressed LV function, for reasons that are not clear. In short, though, the study found no evidence of cardiac damage–at least, in terms of the pumping function–that accrued over the long term. We know that there is some depression of LV and RV function immediately after an intense bout of exercise (eg, marathon, long-distance triathlon, long-distance cycling event), but we also know that these changes resolve within days to weeks afterward. The current study argues against the hypothesis that repeated episodes of intense exercise (ie, many marathons or triathlons over a lifetime) might result in a decrease in LV or RV function. Again, this is encouraging news for endurance athletes. Finally, the CMR and LGE results are important. Aside from the 1 athlete with possible previous pericarditis, there were no worrisome findings of fibrosis or scarring that might be attributable to injury from repeated episodes of intense, strenuous exercise. These LGE findings are at odds with some observations of unexplained fibrosis in other cohorts of long-time runners, even if the consequences of such findings remain uncertain. This area of investigation deserves further attention. For now, I’d say that long-time participation in endurance sports does not necessarily result in unexplained fibrosis in the heart. Do elite athletes live longer? 1. Fatalities in United States triathlons: An expanded profile. I joined with Kevin Harris and colleagues from the Minneapolis Heart Institute to report on 106 fatalities in American triathlons since 1985. The average age of victims was 47 years–approximately 12 years older, on average, than participants as a whole. The majority of victims (85%) were male. The approximate fatality rate was 1.52 per 100,000 participants, with a rate of 2.05 per 100,000 participants in men and 0.71 per 100,000 participants for women. The majority of deaths (71%) occurred during the swim portion of events, with smaller numbers during the bike or run segments, or immediately after the race. Trauma was the most common cause of death during the bike segment. The vast majority of other deaths involved cardiac arrest at the race venue. Autopsy information was collected for 41 victims. Among those autopsies, significant cardiovascular disease (coronary artery disease, hypertrophic or dilated cardiomyopathy, coronary artery anomaly, Wolfe-Parkinson-White syndrome, arrhythmogenic right ventricular cardiomyopathy [ARVC]) that caused or contributed to death was found in 55%. My take: This is the most comprehensive look yet at triathlon fatalities. The findings remind us of the critical importance of safety planning and execution on the part of event organizers during the swim portion of events. The preponderance of deaths among men, particularly those of middle age, and the preponderance of cardiovascular disease among victims suggests that targeted cardiac screening might be helpful for reducing the number of fatalities. We’re working hard on preparing a full-length article. I’ll report back when it’s published. 2. Automated cardiac arrest detection and alerting system using a smartphone and standard Bluetooth chest strap heart rate monitor during exercise: The “Parachute” app. Nicola Gaibazzi and colleagues from University Hospital in Padua, Italy report on their initial experience–essentially, a feasibility study–with a smartphone app/Bluetooth heart rate strap that can detect cardiac arrest and automatically alert emergency response services by SMS, reporting a GPS location for the incapacitated athlete. The authors make special note that no special hardware is needed since many runners and cyclists likely already carry a cell phone. The investigators report that the system has been tested in 10 athletes for a total of 32 hours of running and 52 hours of cycling. During that period, there were no “false alarms,” where an emergency message was sent unnecessarily. The system has also been tested in the laboratory with equipment that simulates a fatal arrhythmia and the system’s arrhythmia detection system was 100% effective in recognizing ventricular fibrillation (VF). My take: As somebody who often runs or cycles alone, there is obvious appeal. Additional testing, particularly in the field, will be needed to sort out the issue of possible “false alarms” and to be certain the arrhythmia detection algorithm is truly robust. Given the pace of technological development related to heart rate monitors, I suspect that we will see more systems like this become commercially available in the near term. I wonder, though, about what impact such devices/systems might have on the survivability of unwitnessed cardiac arrest, where the importance of prompt CPR and defibrillation are known to be essential. 3. A novel pre-participation questionnaire for young competitive athletes. Despite years of study and a considerable literature based on expert opinion, there is still no consensus in this country about whether–and how to–screen young competitive athletes for hidden, unsuspected heart conditions that place such athletes at risk for sudden cardiac death (SCD) during sports activities. The American Heart Association (AHA) currently recommends a 12-item questionnaire that combines medical history and physical examination (PE) findings. The European Society of Cardiology (ESC) currently recommends a medical history, PE, and a resting ECG. In this study by James McKinney and colleagues from the University of British Columbia, one group of 686 young (age 12-35 years) athletes underwent screening with the AHA 12-item questionnaire, PE, and ECG. Another group of 674 young athletes underwent screening with a new, novel questionnaire and an ECG, but did not have a PE. In the first group, 59 athletes (8.6%) required follow-up testing because of abnormal findings during the screening process; 5 (8.9%, 5/59) of these athletes were actually found to have significant heart conditions. In the second group, 31 athletes (4.6%) required follow-up testing because of abnormal findings during the screening process; 6 (19.4%, 6/31) of these athletes were actually found to have significant heart conditions. So, perhaps surprisingly, the positive predictive value of the new approach (that omitted a PE) was significantly and considerably better. By reducing the false-positive rate of the screening process, this new approach might be potentially more efficient, less costly, and cause less disruption in the sports routine for athletes while additional testing is obtained. My take: False positives during a screening process for rare conditions can be very costly in terms of additional testing and time lost from sports participation, so strategies to reduce the frequency of false-positives would be welcome. The study points out what we’re taught early on in medical school: 90% of diagnosis can be derived from a conversation with the patient! 4. Electrocardiogram utilization in the marathon medical tent. Jennifer Michaud Finch and colleagues from Massachusetts General Hospital and Northwestern University report on the utilization rate and clinical impact of ECG in the medical tent of the 2015 Chicago Marathon. There were 37,000 finishers. A total of 12 ECGs were performed: 5 for chest pain, 2 for pre-syncope, 1 for exertional syncope, and 1 for post-exertional syncope. One case of ST segment elevation and T wave changes, suggestive of acute coronary syndrome, was identified and the athlete was transferred to the hospital. Much more commonly, though, the ECG was useful for reducing the concern for an acute cardiovascular problem. Medical tent providers rated the clinical value of the medical tent ECG as an 8 on a 10-point scale. The authors concluded that, although performed very infrequently, medical tent ECGs were very helpful in making decisions about athlete diagnosis and triage. My take: It appears that the ability to perform an ECG in the medical tent for a large, urban marathon is important. Obviously, expert interpretation is needed in order to make correct decisions about diagnosis, on-site treatment, and potential transfer to the hospital. It is important to remember, though, that the ECG was used for only 1 per 3,080 runners. For smaller races, then, which may have less sophisticated (or no) medical tents, consideration might be given for triage to the hospital emergency room in the unusual case where an ECG is thought to be needed. 5. The impact of age and completion of a moderate distance running race on cardiac function: Results from P.E.A.C.H. (Profiling the Effects of Aging on Exercise-induced CHanges in Cardiac Mechanics). We know from previous reports that there is release of cardiac enzymes into the blood stream as well as a transient decrease in the pumping strength of both ventricles after long endurance events such as triathlon, long-distance cycling, or long-distance running. This phenomenon is sometimes referred to as “cardiac fatigue.” Much less information, though, has been reported about potential adverse cardiac outcomes after moderate distance running races, despite the huge popularity and participation in such events. Jonathan Kim and colleagues from Emory University report on a group of 73 athletes who participated in the 2015 Peachtree 10k running race in Atlanta, Georgia. Each athlete underwent a limited echocardiogram 24-48 hours before the race and then again immediately (within 5 minutes of finish) after the race. There were no decreases in the important echocardiographic indices of cardiac function after the race, for either the left or the right ventricle. My take: This is an intriguing finding. One might wonder what is so different about a 10k race, compared to a half marathon for instance. We do know that, with long-distance events, cardiac enzymes return to normal and changes in cardiac function detected by echocardiogram return to normal within days after the event. The long-term consequences, if any, remain unclear. Some have theorized that repeated “episodes” of transient cardiac damage, arising from participation in many such events over a lifetime, might result in harm to the heart. The findings of the current study suggest that participation in shorter events may not carry the same long-term risk. As I mentioned in my last blog post, I recently visited in Tokyo with the Japan Triathlon Union about the issue of athlete safety. I had the chance to speak (albeit with translation!) with the race directors from many of Japan’s major triathlon races. 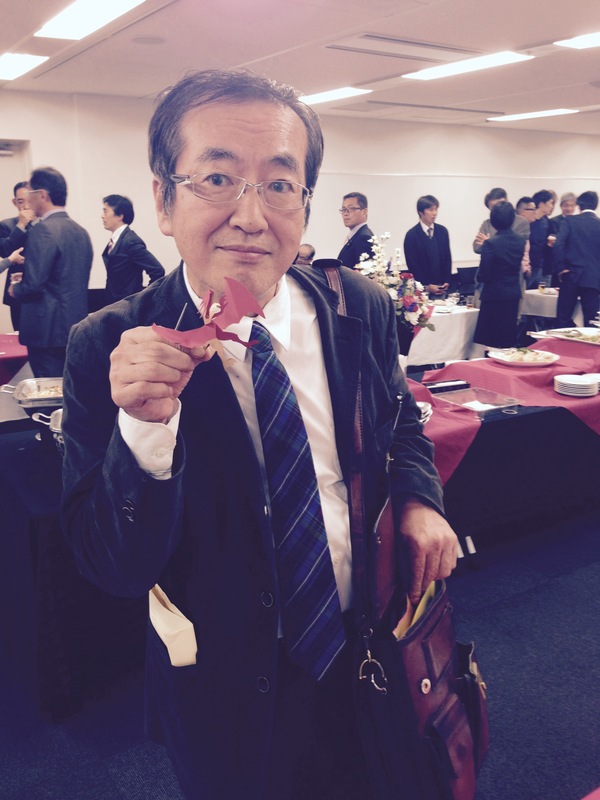 Dr. Masakazu Kawai, from the Yamagata prefecture, had a novel idea about swim safety to share with the group. But first, to set the stage…. We know that being able to rescue a swimmer in distress in one of the most important aspects of an effective safety plan for a triathlon or stand-alone open water swim. Fortunately, in most cases, the on-water lifesaving team is able to spot swimmers in distress who might be struggling to swim, or wave, or even simply yell that they need help. For the lifeless swimmer–the victim of drowning, near drowning, or cardiac arrest–identification of the victim can be much more challenging. And yet identification of the victim, prompt rescue from the water, and provision of CPR and use of the AED, if needed, is the chain of action that must be accomplished in just a very few minutes in order to avoid a fatality. This chain all begins with identifying the victim. 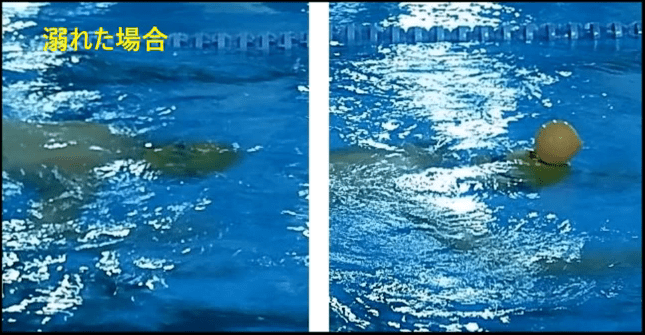 In a crowd of swimmers, oftentimes all wearing black wetsuits, it can be hard to spot the single athlete who has gone lifeless and who is floating, but no longer swimming. From afar, it can be difficult to tell whose arms are whose and it can be difficult to tell if a head is rotating to take a breath. This is where Dr. Kawai’s idea might be helpful. He suggests the use of a small, inflated, brightly-colored balloon that would be attached to each swimmer’s swim cap. As the athlete is swimming, the balloon would bob left and right, with each turn of the head. If an athlete goes lifeless, the balloon would simply sit still on the top of the water. In a group of swimmers, then, there would be a very visible clue to a single lifeless swimmer–the single balloon that was no longer bobbing. This might be visible even from a considerable distance and allow early, perhaps immediate, recognition of the lifeless swimmer. Watch a short video clip that shows the idea and let me know what you think. I’ll pass along any feedback to Dr. Kawai. He’s also looking for event organizers to trial his idea. We need simple, creative ideas like this. I’ve recently returned from a trip to Tokyo, Japan, where I was the guest of the Japan Triathlon Union (JTU). The occasion was their organization’s 5th Annual Forum, which this year was devoted to the issue of triathlon race safety. I appreciate the kind invitation from Mr. Otsuka and Mr. Nakayama, the help of JTU’s Kenta Kodama with the travel arrangements, and the tremendous help with translation from Ms. Tomoko Wada. My hosts were gracious in every way. I must also thank the kind folks at USA Triathlon (USAT)–Terri Waters and Kathy Matejka, for help with gathering some updated information to present in Japan, and USAT President Barry Siff for making the necessary connections with JTU. As readers here will know, I’ve had an interest in triathlon-related fatalities and the broader issue of sudden cardiac death among endurance athletes. I had the opportunity to lead a recent USAT effort to learn more about triathlon-related fatalities and our work resulted in a 2012 report entitled “Fatality Incidents Study.” As I’ve said before, this report is good reading for athletes and event organizers who are looking for recommendations about how to race safely and conduct events with athlete safety as a first priority. Sadly, there were 6 triathlon-related fatalities in Japan in 2015, the most ever in a single year there. Dr. Ryoji Kasanami, the Chairman of the JTU’s Medical Committee, had become familiar with our work here in the USA and was interested in learning how our findings might help JTU with better safety planning, on the parts of both athletes and event organizers. Dr. Kevin Harris, from the Minneapolis Heart Institute, and I will be presenting an abstract at the upcoming American College of Cardiology meeting in April in Chicago on this topic. We’ll be sharing consolidated information about 106 fatalities, including the autopsy findings from 41 of the non-traumatic fatalities. I’ll report back here at the blog with an update in April. Interestingly, the bike course is always closed to vehicular traffic during triathlons in Japan, and this might obviously have an impact on the number of crashes and trauma-related fatalities. One interesting anecdote shared by a pathologist attendee related to the finding of inner ear bleeding (hemorrhage) in 2 victims. I’m not sure about the significance of this observation. I’m intrigued by the many similarities of the Japanese experience with race-related fatalities. I also know from preliminary discussions with officials at Triathlon Australia that the experience in Australia is similar as well. I suspect that the causes of cardiac arrest in participating athletes are common broadly, and are more dependent on simply the human condition rather than race-related factors that might be specific to one region or another (eg, race safety or technical rules, approach to medical care on site, warm-up, etc.). I’ll mention here that the Medical Committee of the International Triathlon Union (ITU) is very interested in this issue, particularly as it relates to elite athletes. I understand that efforts are being made to implement the requirement for mandatory periodic health evaluations, including EKG screening, for youth, U23, and elite athletes who participate in ITU races, perhaps beginning in the 2017 season. This follows on the heels of the international rowing federation adopting a similar policy, gradually, during the 2014 and 2015 seasons. I worry a little about the ITU focus on elite athletes, since the problem of race-related fatalities seems to be largely one of age-group athletes, but I hope that age-group athletes will be paying attention to any recommendations that are implemented. Lastly, I’ll close with some photographs from the trip. Since this was my first-ever visit to Tokyo and Japan, my hosts graciously afforded me about 8 hours of free time one day for the purpose of sightseeing and I took advantage. I hope to return to Japan soon to see even more. Fatal Arrhythmias in Open Water Swimming: What’s the Mechanism?